Every six weeks the farrier visits to remove Max’s shoes, trim his feet back and replace the old shoes with a set of new ones. But, as he has not been ridden this winter they are not worn very much, so this visit I got off lightly as his old shoes were replaced. You couldn’t wish for an easier horse to shoe, Max is such a good boy, perfect for my farrier’s new apprentice, Sarah, to practice on! Although, in case you should wonder, this shot is of Steve burning the shoe onto Max’s foot. This entry was posted in Max by Country lover. Bookmark the permalink. Oh heck! Does it hurt them? Thanks for popping by. No, on the outer horn of the hoof it’s just like our nails, no feeling at all. No, on the outside of their hoof, the horn, they have no feeling, like our nails. Thanks Jenny, for the visit. Never mind, we can’t all like the same things. Thought the photo might interest townies, who have probably never seen a horse shod. Am a little bereft for subject matter, away from the flora and fauna and my cats, here in the countryside! Thanks for your comment, much appreciated. 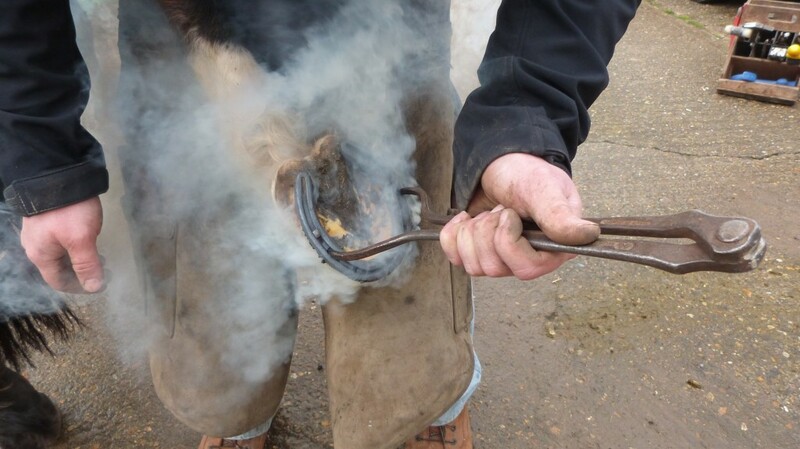 It’s quite an art to watch a Farrier at work and at least it’s one livelihood that will stand the test of time! Hi Fiona, yes it’s a guaranteed livelihood, which can’t be bad these days. Thanks for the visit. Very interesting. I used to love horseriding when I was younger but I haven’t been for years. Hello Joanne, thanks for the visit! You should take it up again, it helps to keep you supple and it’s lovely to get out in the fresh air, just you and the horse! Ooh what a great shot. Sounds painful but im guessing its not!! Hello Susan, many thanks for stopping by. You’re right on the area of the horn of the hoof, there is no feeling, just as we feel nothing when we cut out nails!